So, does that collage look utterly meaningless? Don't worry, I'm not just going to throw up these pictures without any context. The point of these images, after all, is to give context. The upper left-hand corner is a plaque outside of Jane Austen's home in Chawton. It says: Jane Austen lived her from 1809-1917 and hence all of her works were sent into the world. Her admirers in this country and in America have united to erect this tablet. Such art as hers can never grow old. To the immediate right is a picture of Jane's desk, kept behind the teeniest barrier at the museum inside the Chawton house. Can you imagine doing your work with so little space? Second from the bottom on the right are the graves of Cassandra Elizabeth and Cassandra Austen, Jane's sister and niece. They rest in a churchyard down the street from the Chawton house. There are three pictures of the Bath assembly rooms: top right, bottom left, and middle. These rooms feature in both Northanger Abbey and Persuasion. The green one is the Octagon Room, but I know longer remember which is which of the other two. One of the great mysteries of Northanger Abbey is why Catherine is so eager to see a Gothic building when there's one smack dab in the middle of Bath. The image that is second from the left on the bottom is a detail from Bath Abbey, the missing building of Jane Austen's first novel. The bottom right picture was also taken in Bath. That's part of the Roman baths that still exists today. And yes, you can go into the Pump Room and drink some of the waters for your health. I did it, to my friends' disbelief, but the water tasted pretty nasty. We're almost out of Bath! Second from the bottom on the left is a picture of graffiti on the Palladian Bridge in the Prior Park Gardens, made in 1809. Even people in Jane's time had to leave their mark. Right above the graffiti is a picture of Lyme Regis. That dark line in the background, at the edge of the sea, is the Cobb. Sadly I wasn't able to take many pictures in Lyme due to the rain. But believe me, if you do walk on the Cobb, try not to do it in the pouring rain after recently reading Persuasion. You won't feel very steady if you're anything like me. The final image, bottom middle, is of the Palladian Bridge and Temple of Apollo in the Stourhead Gardens, seen in Pride and Prejudice (2005). While Jane never set anything in Stourhead, she wrote frequently about the picturesque aesthetic of which Stourhead is a prime example. I hope the pictures aren't too small; this was my first time creating a collage for the web. Feel free to tweet me @wearedevilcow if you want to see a larger version of one of the pictures. Lovely photos - and thanks for contextualizing them a bit for us! 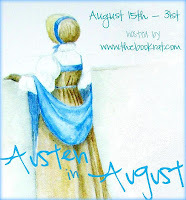 I can see I need to start saving for an Austen-themed vacation. You really should, she wrote about some lovely places! Sadly one of the things that made my study abroad more affordable (a British Heritage pass) is no longer sold. This is gorgeous! I love Bath- my sister lives there so I get to go and explore often! It is very pretty. 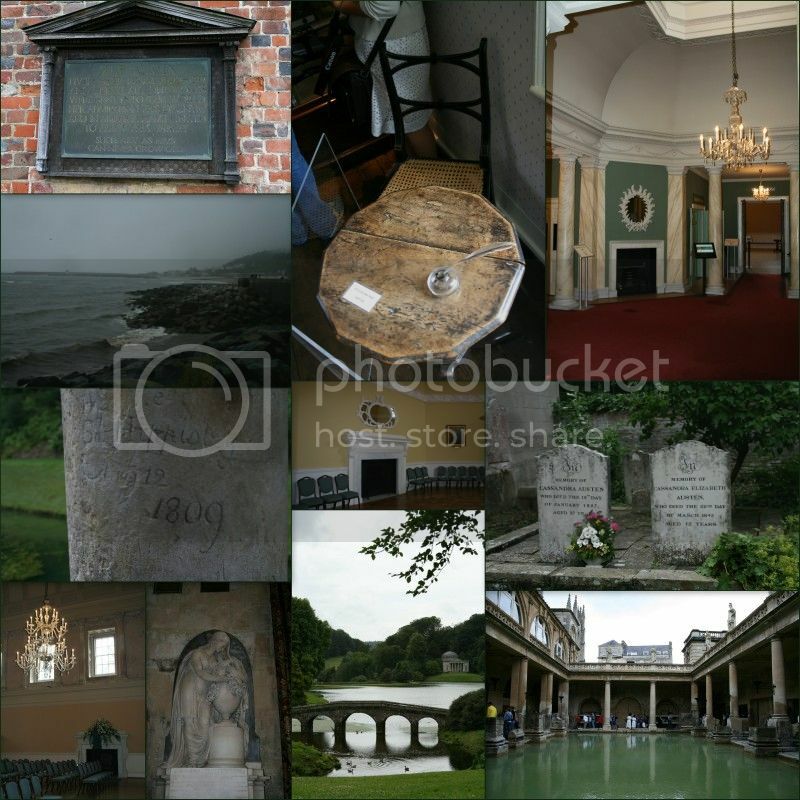 I went to the Jane Austen museum there a long time ago (as a treat for passing my GCSE'S... I was a geeky 15 year old). I must go again! I'm jealous that you get to visit Bath so often! I wish I could've spent more time poking around. Never been a cross the great divide but i'd love to. those pics are gorgeous. Thanks for sharing.